It is a fact. Maybe The Dalai Lama has not even met you, but he is in no doubt; he thinks you are really special and has good reasons for thinking so. He made all of this very clear in Melbourne last week. 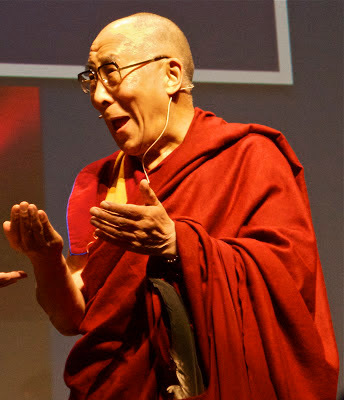 So let us go “Out on a Limb” once more, investigate how it is that the Dalai Lama could know you well enough to say he likes you so much, and share some great photos that convey something of the man and his message. That is what education is about. Last week, Ruth and I along with nearly 6,000 others had the good fortune to attend the Dalai Lama’s public talk in Melbourne, following up next day with more formal teachings on the Heart Sutra and The 8 Verses of Mind Training. 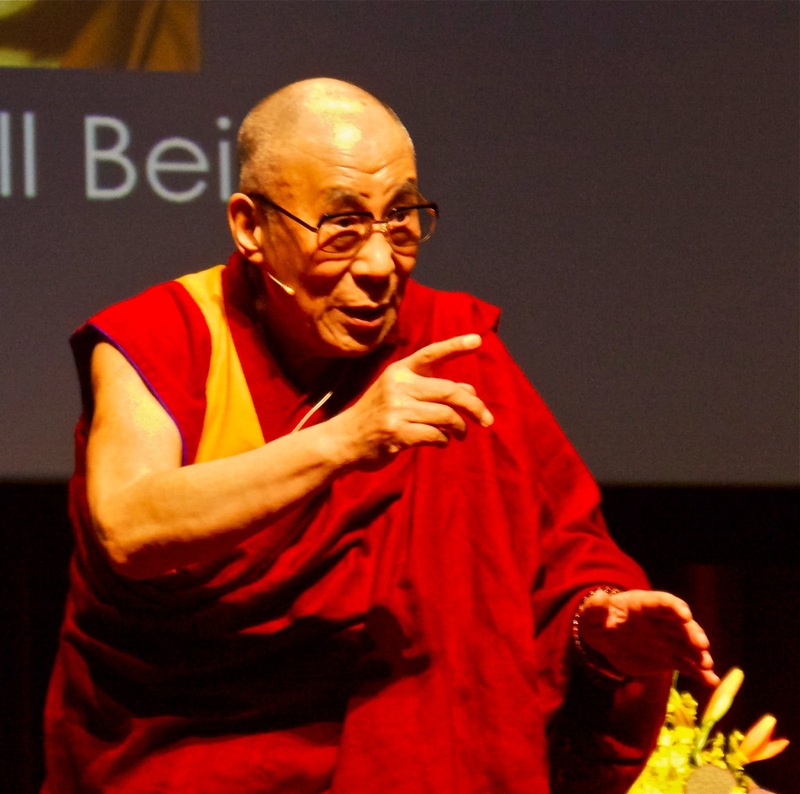 So why is it that the Dalai Lama respects you so much and is so confident you are so special? It is because in so many ways you are just the same as the 7 billion other people on this planet. We all share much in common. Physically we all eat, drink and … you know the rest! He thinks it is funny too! But then again, we all have emotions and minds that can be beset by one trouble after another, but we all (well most anyway) have minds that are coherent enough that if we decide to, we can train them and go beyond ordinary human difficulties and confusions and sufferings, and find long-lasting happiness. 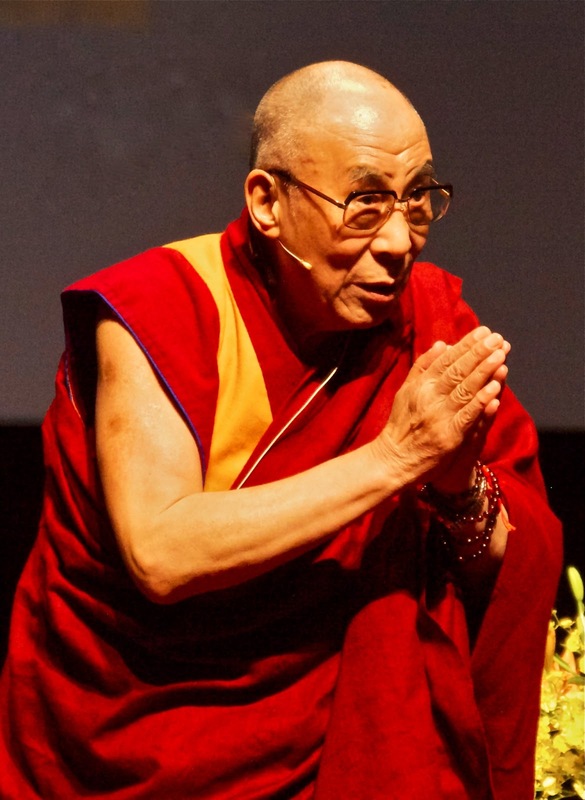 However, of even greater significance, the Dalai Lama is in no doubt that as a human being what you undoubtedly share with the other 7 billion of us is that we all have fundamental goodness. 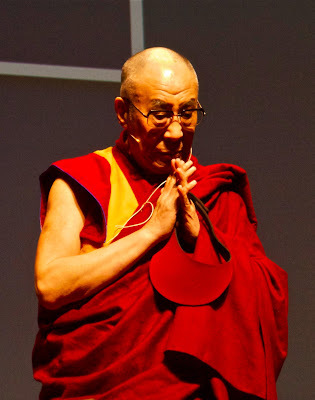 The inner potential for full enlightenment - as he would put it. This is what he really admires in you. This is what he sees in you. This is what he bows to. This is why he travels the world speaking wherever he can, and giving his life to teaching everyone who will listen. For this message, when taken to heart, when realized, is a direct antidote to any personal misgivings we may have about our selves. A direct antidote to any feelings of low self-esteem or self-hatred. When we know that in our hearts, in our essence, there is this fundamental goodness, this intrinsic purity, then how can we do anything but respect who we really are? My sense of it is that the root cause of so many of the current maladies that affect people, and I see this over and over in young and old, is low self-esteem. An uncertainty about fundamental worth. Confusion about "who I really am?" and "what I am really worth?" With low self-esteem comes low self-love and then comes recrimination. Guilt, shame, self-abuse in both obvious and subtle ways. So much chronic, degenerative disease has low self-esteem at its heart. With a healthy sense of self-worth comes self-love and self-care. How could you not look after yourself if you have a sense of this fundamental goodness? Dare I say it, this self-love is like having a direct and unshakeable sense of the sacred within. What follows has to be self-care. So much good health has high self-esteem at its heart. But then of course there is a major bonus. When we recognise the essential goodness in our self, we naturally recognise the essential goodness in others - all 7 billion of them. While we also can recognise that on the outer level people stuff up, we stuff up, we know that in our hearts we are all pure and good; so there is a basic respect for the potential of each and every person. By finding peace in our heart, we naturally generate peace towards others and contribute to peace in our world. Peace will never be imposed on the world. A peaceful world can only ever be made up of a world full of people at peace in their own hearts. Recognising our fundamental goodness brings "a peace that passes all understanding". Deep, natural peace. How do we deal with the fact that we stuff up (well just occasionlly maybe)? How do we develop our own confidence in this fundamental goodness? 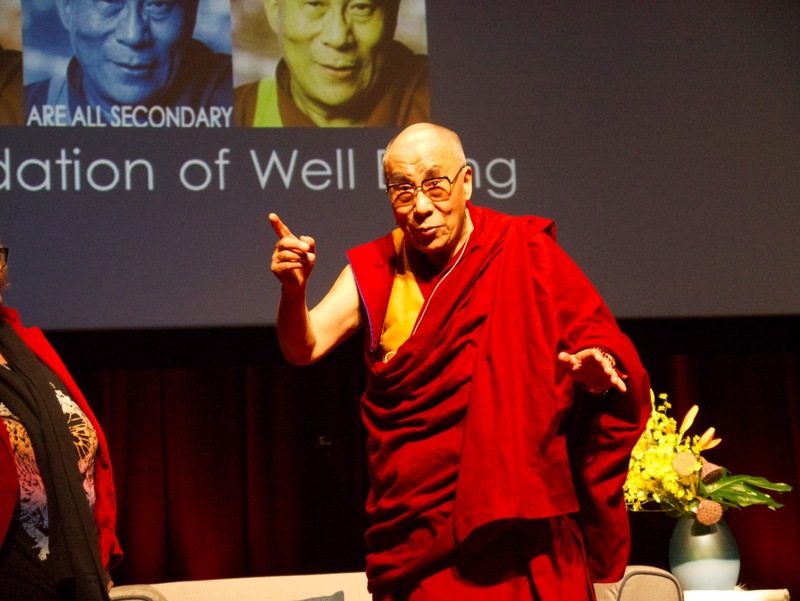 The Dalai Lama is clear about the answer to these questions as well: train the mind and practice meditation. Of the specific teachings he gave, the Heart Sutra is a famous teaching that brings out the essence or the heart of the Buddha's teachings. Through the gradual process of cultivating wisdom, it points out that we can develop the ability to cut through delusions and understand the ultimate nature of the way in which 'I' and all phenomena exist. The Eight Verses of Mind Training shows us how, through generating compassion, loving kindness and altruism, we can transform our ordinary mind into attaining enlightenment. I’m very happy to be here once more, having the opportunity of meeting with long-time friends. So, two years have passed, I’m wondering, among our old friends, in the last two years, how many have progressed, in your mental quality? Physically we have become older and older, no force can stop that… so it is really worthwhile day by day, week by week, that there is some improvement to mental quality, so that our life can become more meaningful. So there is the challenge: What have we done recently to improve our “mental quality”? What have we done to train our mind? 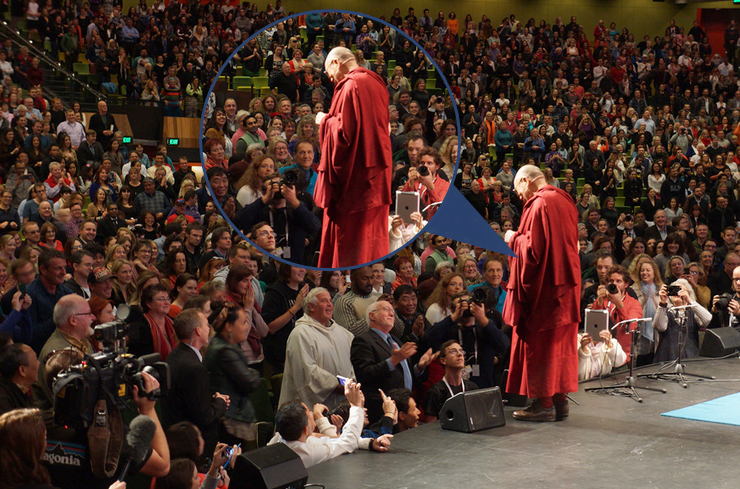 How much meditation have we been practising? This is one of the great benefits of a visit from someone like the Dalai Lama, he reminds us, he re-inspires us to do what we know is so good for us. This will be my 30th year presenting at the Relaxation Centre in Brisbane. Ruth and I love these events where we get to meet up with people we know, make new friends, to remind ourselves and others of what works and to share the latest in our field of health, healing and wellbeing. Please do forward the details to those you may know in any of these places and if you live nearby, we hope to see you at one of the events. Bring your family (we had 5 members from the same family share a day seminar recently), come with a friend, tell your colleagues. These seminars are interactive, a great way to review what you already know, to be re-inspired and re-enthused, and to learn exciting new things, like the latest breakthroughs in epigenetics, the neurosciences, telomeres and nutrition. Famous Harvard Professor demonstrates that the Relaxation Response positively changes gene expression – even in a single session! Herbert Benson (author of the highly recommended The Relaxation Response) first described the relaxation response – the physiologic opposite of the fight-or-flight response – almost 40 years ago, and his team has pioneered the application of mind/body techniques to a wide range of health problems. Studies in many peer-reviewed journals have documented how the Relaxation Response alleviates symptoms of anxiety and many other disorders and also affects factors such as heart rate, blood pressure, oxygen consumption and brain activity. In 2008, Benson and Libermann led a study finding that long-term practice of the relaxation response changed the expression of genes involved with the body's response to stress. The current study examined changes produced during a single session of Relaxation Response practice, as well as those taking place over longer periods of time. Both short-term and long-term practitioners evoked significant temporal gene expression changes with greater significance in the latter as compared to novices. Relaxation Response practice enhanced expression of genes associated with energy metabolism, mitochondrial function, insulin secretion and telomere maintenance, and reduced expression of genes linked to inflammatory response and stress-related pathways. The published results for the first time indicate that Relaxation Response elicitation, particularly after long-term practice, may evoke its downstream health benefits by improving mitochondrial energy production and utilization and thus promoting mitochondrial resiliency through upregulation of ATPase and insulin function. Benson stresses that the long-term practitioners in this study elicited the relaxation response through many different techniques – various forms of meditation, yoga or prayer – but those differences were not reflected in the gene expression patterns. "People have been engaging in these practices for thousands of years, and our finding of this unity of function on a basic-science, genomic level gives greater credibility to what some have called 'new age medicine,' " he says. The full reference is : Bhasin MK, Dusek JA, Chang B-H, Joseph MG, Denninger JW, et al. (2013) Relaxation Response Induces Temporal Transcriptome Changes in Energy Metabolism, Insulin Secretion and Inflammatory Pathways. What a wonderful set of photos of this great man. Thank you Ian for giving such a great write-up.